Now that an election is a sure thing and set for the 2nd of May, it's time to take a closer look at the positions of the four/five main parties in Canada. 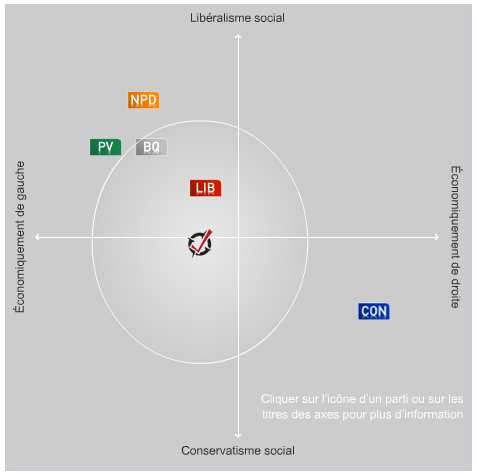 A page here on CTV lets you answer either in English or French to a number of questions that will then tell you which party your political views are closest to. You don't have to fill out the postal code in the beginning, so non-Canadians that don't feel like finding a fake postal code can try it out too. It would be interesting to see what results some of the non-Canadian readers of the site have. If you want to upload a screenshot of your own results then www.imgur.com is the easiest way to do so.